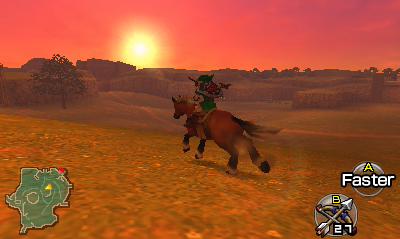 With all the focus on some of the new material for Ocarina of Time 3D, I wanted to touch on a few older things that I got to experience during my hands on with the game. In particular, I wanted to give my thoughts on the 3D effect and the Gyroscope controls. Before I get into either of them, I’d like to point out that these are both new features for the 3DS remake and they are also optional, meaning you can turn them off if you would like to. I’d also like to note, that up until now, the only game that I’ve really played much of for the Nintendo 3DS is Super Street Fighter IV. When Nintendo first announced its brand new handheld, the 3D was immediately the central focus of attention. Heck, it’s right there in the name, 3DS. The idea of being able to play and view games and other media in 3D without the need of glasses. The console released a few months back and the 3D effect overall has been praised for its quality, but on the other side of the coin, it has been criticized by some for not adding enough to the actual game. 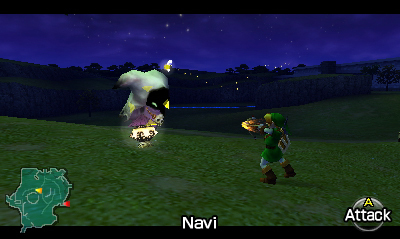 So how does it fair in Ocarina of Time 3D? Jump on in to see my thoughts. Once the demo started for me, I was immediately tossed right into the Water Temple with the 3D on full effect. Right away the picture was blurry, as I needed to adjust to the 3D effect. After a few moments though, my eyes settled in to that sweet spot and the picture had become crystal clear. It was absolutely beautiful. I could see the added depth that the 3D gave and I had a better idea that certain objects were in the distance. The effect was nice and it truly was a bonus for the experience. Throughout my talks with the Nintendo of America representatives I was occasionally looking up at the person who was talking to me. Each time I then looked back at the Nintendo 3DS, I had to take that few seconds to adjust to the 3D again, finding that sweet spot. It did become a bit cumbersome after doing this a few times. After the Nintendo folks gave me the first tour of some of the features, I then got to play a solid 5-10 minutes of the Water Temple in which I was more zoned in and I could appreciate the 3D effect more. Basically what it boils down to for a game like this, you’ll want to use the 3D effect if you are completely zoned in on the game without any outside distractions that are going to pull away your eyes for a few moments. Does the 3D effect add to any gameplay elements? No, not that I’m aware of. Based on what I was able to play, the game is very similar to the Nintendo 64 original, meaning most of the puzzles are fairly set in stone. There are no puzzles or battles that I’m aware of that the 3D effect will make any different. The game does not seem to be built around the 3D, but rather, 3D has been added to give it a better visual experience for the player. 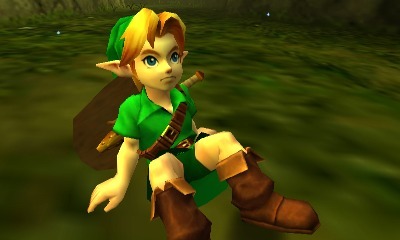 Perhaps future games on the Nintendo 3DS will be built around the 3D, but Ocarina of Time is not one of them. 3D is a great visual add-on, but does not impact gameplay. One of the other new gameplay features is the use of the Nintendo 3DS Gyroscope. The Gyroscope will allow you to adjust the camera by literally turning the Nintendo 3DS to the left or right. In particular for Ocarina of Time 3D, this was used when aiming the hookshot, bow and arrow, or other projectile weapons. After pressing the button for the hookshot, I literally held the Nintendo 3DS up and turned it to the left to aim at switch across the room. The first time I used the gyroscopic controls, it felt a bit strange, but I quickly got use to it and really liked it. I don’t necessarily think that it makes aiming easier, but it does give you a better sense of realism. The best comparison I can think of is the aiming of the projectile items in Twilight Princess for the Nintendo Wii. You had the option of using the standard joystick to aim your projectile, or you could point and shoot with the Nintendo Wii controller. The point and shoot way seemed more realistic, but I’m not quite sure everybody would agree that it universally was the better aiming method. For the Nintendo 3DS, the gyroscopic controls felt better, but I personally thought it was a bit more difficult to aim properly. The biggest complaint I had during my entire demo with Ocarina of Time 3D is when the gyroscopic controls were being used while the 3D was in full effect. The issue that I repeatedly had, was that I was zoned in on the sweet spot of the 3D graphics. Once I turned the 3DS to the left or right for the gyroscopic controls, I was losing that sweet spot, blurring the image, and it was causing the aiming to be incredibly difficult. It really took several tries in order for me to get the aiming done properly. You have to turn your head, while also rotating the Nintendo 3DS to use the gyroscopic controls to keep the 3D sweet spot. There certainly is a learning curve to get this exactly right and you’ll mess up a few times before figuring it out. My overall thoughts are that the Nintendo 3DS Gyroscope and the 3D effect are extra features and not something that is a requirement to enjoy the game. 3D definitely adds to the visual experience, but the gameplay isn’t focused around it. The Gyroscope has a good feel to it, but classic controls can be used as an alternative. They are great additions that most gamers will use, but for those who do not like them, no problem as you can just turn them off. Ocarina of Time 3D is set for release on June 19th here in the United States and we’ll be continuing our coverage of the game up through release. Be sure to check back here at the site often for all the latest news and media. Until then though, be sure to voice your thoughts by posting in the comments below!